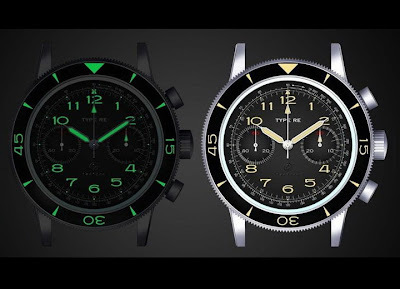 By TLex t.a.c.t.i.c.o watches have revealed their third model, the Type RE. The watch is still in the development phase, but they would like to know which lume job to go with. Vintage C3 green or modern BGW9 blue? Personally I love blue lume, but in this instance the vintage would seem more appropriate . . .
Join the discussion on Facebook . . .
Green lume on this one. Gorgeous watch to boot. Love it.